A new website—www.designs4icf.com—has been created to promote ICF home designs. The site is expected to be operational by the first of November. The Insulating Concrete Forms Association (ICFA) has undergone a major restructuring, emerging with a new board of directors and day-to-day manager. Effective August 9th, Murray Snider became president of the ICFA board of directors. Dean Seibert, former chairman, stepped down along with the rest of the board. The new board is composed exclusively of primary members, and includes Pat McMahon of Amvic, now vice-president; and Jeff Alexander of Greenblock Worldwide as secretary/treasurer. “ICFA restructured its board of directors to create more focus and… exponentially strengthen the association’s primary goal to promote the use of ICFs,” says Snider. ICFA has closed its Glenview, Ill.
offices and has moved day-to-day management to Crofton, Maryland, where expenses can be shared with the Expanded Polystyrene Molders Association (EPSMA) and the Alliance of Foam Packaging Recyclers (AFPR). Elizabeth Steiner, current executive director of EPSMA and AFPR, is now executive director of ICFA as well. “Our top priority is to provide maximum value to our members,” Steiner says. With the change, ICFA moves back to more of a manufacturer-based organization, in line with its funding. Steiner says the association will be revising its committee structure to be more inclusive of associate, distributor and contractor members. She is hopeful this will provide a channel for the membership to communicate their feelings to the board. With a new management structure in place, ICFA has scheduled their annual Conference and Expo for Nov. 4 through 6 at the new Hilton Orlando in Florida. The conference will open Wednesday morning with an air cannon demonstration, showing how ICFs compare with other wall systems when hit with storm-driven flying debris. After lunch the conference officially kicks off with the introduction of the new ICFA board of directors and a state-of-the-industry presentation. The next two days will be filled with valuable and informative sessions directed at both contractors and manufacturers. There will be how-to sessions, educational presentations, marketing seminars, and economic forecasts tailored to the ICF industry. The expo will include exhibitors from across the industry. Expo organizers say there will be plenty of time to talk with the exhibitors and network with industry representatives over the three-day conference. The conference concludes at Noon on Friday, November 6. To register, or for more information, visit www.forms.org. Greenbuild 2009, the largest green building event in the United States, will be held in Phoenix, Arizona from Nov. 11 through 13. The trade show is one of the fastest growing in the country, and this year will include more than 1,800 exhibitors, including nearly a dozen ICF manufacturers. It will also feature more than 100 educational sessions and workshops, nearly all of which will count as Continuing Education Units (CEUs). The U.S. Green Building Council, which hosts the event, is a registered program provider for AIA/CES, ASID/IIDA, BOMI, and IFMA. The keynote speaker at this year’s event is former U.S. vice president Al Gore, who won a Nobel Prize and has written several best-selling books on global warming. 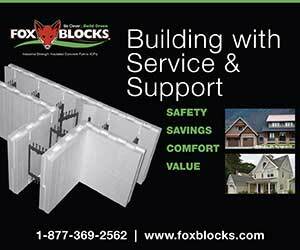 A few of the exhibitors relevant to the ICF industry include BuildBlock, Durisol, HercuWall, Fox Blocks, Greenblock, Logix, Nudura, Quad-Lock, Reward Wall Systems, and Thermomass, as well as trade associations NRMCA and PCA. For more information on the show, visit www.greenbuildexpo.org. One of the highlights of Greenbuild 2009 is the Concrete Home of the Future, built by Salt River Materials Group for the local Habitat for Humanity chapter. The home is built using a new brand of ICFs, HercuWall, which uses a unique post-and-beam concrete design. The home is a stopping point on the Greenbuild 2009 tour. HercuWall has concrete beams at the top and bottom of the wall only, not requiring the regular horizontal reinforcement most screen-grid designs have. HercuWall also features panels that can be delivered in customized “kits” to the jobsite, speeding construction time and cutting costs. (For more information, see page 28). The project was championed by Scott Palmer of Salt River Materials Group. Currently being considered for LEED-Platinum certification, the project features the sustainable aspects of concrete in several other areas, such as a pervious concrete driveway, concrete roof tiles, and exposed concrete floors and countertops. Illinois Gov. Pat Quinn signed a law last month that raised the minimum energy efficiency standards for new homes considerably. Named the Energy Efficient Building Act, it aligns the state with the latest International Energy Conservation Code (IECC) for new residential construction. The bill passed the House 89-28 and the Senate by 48 to 8. The National Ready Mixed Concrete Association (NRMCA) is presenting a series of 18 web seminars, or “webinars” on concrete technology between Oct. 1 and March 31. Taught by subject matter experts, the topics include concrete durability, sustainability, cracking, troubleshooting, quality control/assurance, concrete codes and specifications, pervious concrete and non-destructive testing. Each webinar will be offered twice over the six-month period, and are geared toward concrete producers, specifiers, and contractors. Complete information on all the webinars, including dates, times, fees, topic descriptions, author biographies and registration information, can be found at www.nrmca.org/Education/Online_Learning/Webinars. requiring all LEED-accredited professionals (LEED-AP) to regularly update their training. More than 1,300 LEED-AP professionals registered in the programs first three weeks. Credential maintenance includes continuing education classes, practical application of LEED on green building projects, and active participation in the green building community. A guide to the new CMP program is available at www.gbci.org. Wayne Fenton, an industry pioneer with more than 20 years experience marketing ICFs has announced his retirement from Lite-Form Technologies. 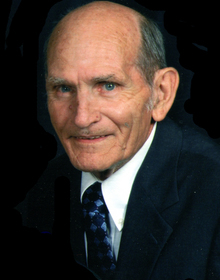 A company loyalist, he spent virtually his entire career at the Nebraska-based business, developing three different ICFs, including the first folding form on the market, and a revolutionary EPS decking system. In addition to his company contributions, he has been a major force in promoting the ICF industry as a whole, helping to organize the ICFA, and attending innumerable trade shows promoting ICF technology. His retirement marks the end of an era for the industry, as he remembers what it was like for ICFs trying to get their original toe-hold in the construction market. 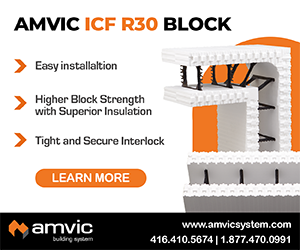 Now, of course, there are more than 50 brands of ICF that share a significant part of the concrete construction market. We extend our best wishes to Mr. Fenton as he leaves the industry he helped shape. We would all be poorer without his contribution. Corrections: The story Rebuilding Greensburg in the Aug. 2009 issue contained several errors. The nearest Logix plant is 120 miles from the town. Also, Ryan McDonald is a residential contractor, not commercial, and the mayor who lives in an ICF home is no longer in office, making him an ex-mayor. 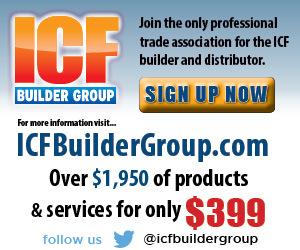 ICF Builder strives for accuracy. If you see something that needs to be corrected, contact the editor at editor@icfmag.com.